Back in July 2012 we showed you how to put singular or plural words against numbers in Excel – like 1 cookie or 3 cookies. At the end we noted how it got more complicated when you tried to deal with one, zero and negative numbers as well because Excel’s cell formatting has limitations. Jon E. has come up with a clever solution which uses conditional formatting to split negative and positive cell values then have formatting appropriate for each side of zero. You need TWO custom numbers, one for the positives, one for the negatives. 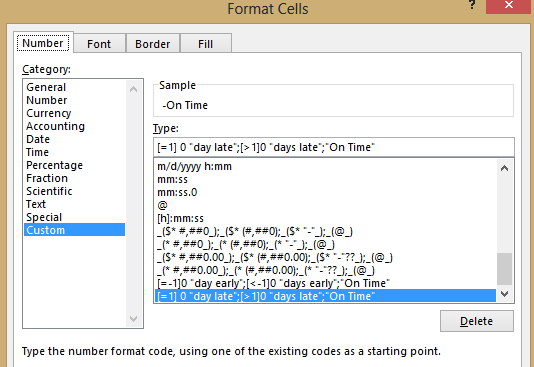 [=-1]0 “day early”;[<-1]0 "days early";"On Time"
One rule handles cell values greater than zero and the other for zero and less. In fact zero can be formatted by either rule. In the format dialog choose Custom and paste in the formatting code above, with words changed to suit your needs. 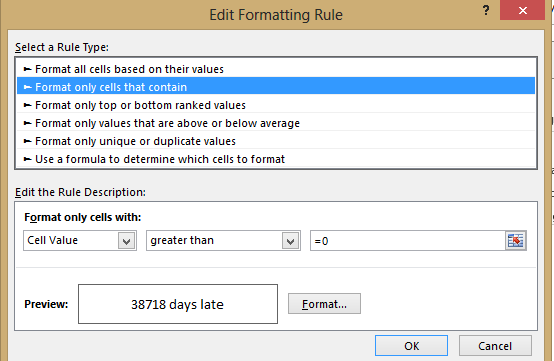 The result is a cell with the value alone in the cell but displayed in the form of readable text. Very nice, great work Jon!